The Université de Napierville (University of Napierville) holds many pages with photos, historical notes, and musical clips; start by this page. This venerable institution also covers many other topics which will surely interest our readers. The session is officially dedicated to irish traditional music (ITM) — some of the members are quite "rigid" about this subject — but one can find a few french-canadian pieces. The Fiddler's Companion, a VERY well documented web site for fiddlers of all breeds; irish, scottish, american, and, of course, french-canadian. The reel thing, a congenial site on irish traditional music. La Société pour la Promotion de la Danse Traditionnelle Québécoise (SPDTQ), (the Society for the Promotion of French-canadian Traditional Dance) an excellent place to take classes (jig, violin, accordeon, harmonica... I personally took penny whistle classes in this school), to buy CDs, or get the latest news. Mnémo, a site compiling various publications, documents and archives on french-canadian traditional music, dance, signing and story telling — a must-see! L'Association québcoise des loisirs folklorique (AQLF) (the Quebecois Association on Folkloric Pastimes) is a treasure trove of information and ressources for all those interested in french-canadian music and dance. The digital recordings section of the Bibliothèque des archives nationales du Québec (Quebec's National Archives Library). The Encyclopedia of Music in Canada... whose name is self-explanatory. Pascal Gemme's blog: Blog TradQuebec. Pascal, is a fiddler and composer playing for Genticorum. This blog is spin-off of his teaching classes. Another good blog on the subject is Christiane Campagna's, Chroniques Trad. Ms. Campagna also co-hosts Tradosphère (see below). The Virtual Gramophone, of Library and Archives Canada, where you can find biographies but, mostly, a very impressive quantity of digitalized 78 rpm or even cylinder recordings — indispensable. Les Danseurs et musiciens de l'Île Jésus (DMIJ) (The Dancers and Musicians of Île Jésus), an amateur association of french-canadian music enthousiasts. Pages by Manu Savinelli from the folk group "Le Diabl' dans la fourche" — on MySpace (here) and on the Web (here). Generous, passionate, and excellent musician... the best recipy to promote french-canadian traditional music... all the way from Normandy! Radiotrad's blog where one can find interviews with many french-canadian musicians. 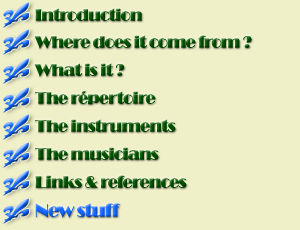 Harmonicanuk, a small but interesting site on harmonica in traditional french-canadian music. Tradosphère is a very good radio show on the subject that airs on CIBL 101.5, on Thuesdays from 20h30 to 22h — all shows are also available as podcasts (beware, you'll get hooked). A curiosity for those who read Italian; there is a french-canadia trad group in Milan, the Andrea Capezzuoli e compagnia. Whistlers du Québec : a blog (in French) for whistle players to be. Danse ce soir!, Fiddle and Accordion Music of Québec, Laurie Hart & Greg Sandlle, Mel Bay, 2001, ISBN 0-7866-6630-7. On the accompanying CD, the musicians are Laurie Hart, Greg Sandell, Stéphane Landry, Paul Marchand, André Marchand, Jean-Claude Mirandette, and Pierre Chartrand.